Smarthome security and privacy is an emerging topic and it has been drawing growing attention during recent years. Computer security and privacy for Smarthome is both fundamentally important and fundamentally challenging. It is important because security and privacy lapses in Smarthome devices can cause not only cultural and financial, but real physical harms to people, their pets, and their environments. It is challenging because of the technical properties of Smarthome devices (the “technical element”) and because of the complex issues that arise when designing technologies for a diverse collection of stakeholders (the “human element”). During that past years, extensive progress in addressing technical challenges in this area has been done, but there are still fundamental human-related challenges which are worthy to focus. 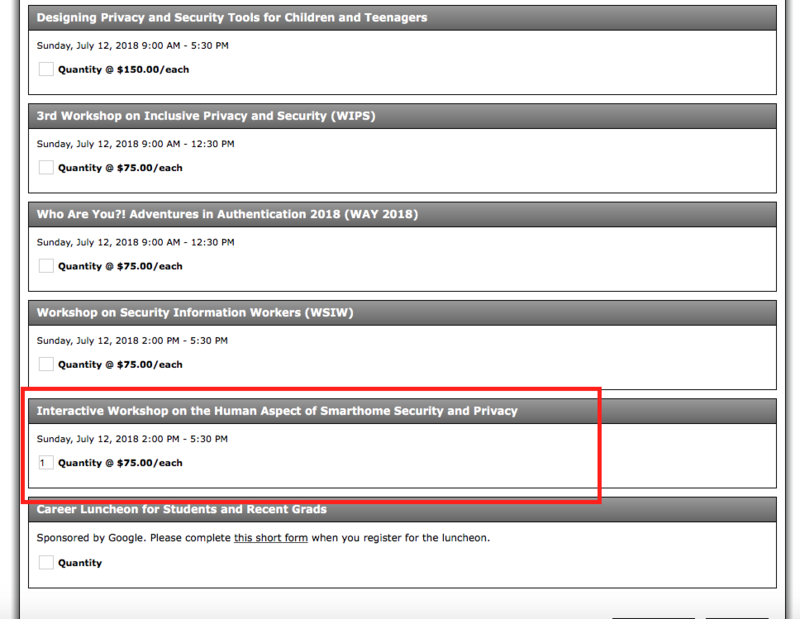 Therefore, this workshop focuses specifically on computer security and privacy at the intersection of human factors of smarthome devises. For instance, enhancing usable security to improve the security and privacy properties of existing smathome technologies. To register for the workshop, please visit the SOUPS registration page. Our goal is to make WSSP a highly interactive workshop – a workshop that can help all attendees, including both authors of papers and non-authors – refine their own and others’ research directions and, ultimately, positively impact the human experience surrounding security, privacy, and smarthome technologies. The agenda is structured to maximize creative, research-enhancing discussions among participants. Below is the workshop agenda, as well as PDF copies of the pre-proceedings versions of each paper. Each paper is short – a few pages long. To facilitate our interactive workshop goals, we ask attendees to read all position papers before the workshop. A discussant (non-author) will present each paper, and then the discussant and session chairs and others will lead discussions inspired by the paper(s) in the session. The following paper will be presented by a discussant for 5 minutes, and then a broad discussion of challenges will follow. The discussion will be inspired by this paper, but can cover a broader range of challenges and related topics. The following papers will be presented by discussants, for 5 minutes each, and then a broad discussion of privacy will follow. The discussion will be inspired by these papers, but can cover a broader range of privacy-related topics. The following papers will be presented, for 5 minutes each, and then a broad discussion of authentication will follow. The discussion will be inspired by these papers, but can cover a broader range of privacy-related topics. 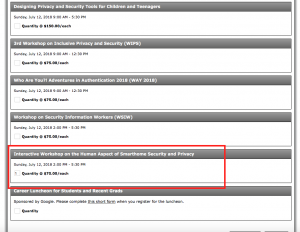 This is the first workshop on the Human aspects of Smarthome Security and Privacy. The main focus of this event is exploring and addressing computer security and privacy challenges at the intersection of human factors of smarthome devices. This is a highly interactive workshop for engaging in discussion and in collaborative activities to explore critical challenges and proposed solutions in this area. In addition, the discussions and collaborations during the workshop can help authors to enhance the final version of their papers before these are developed into post-workshop proceedings. This workshop invites position papers, works in progress, and extended abstracts. Reviewing of the submitted papers is double blind and submitted papers should avoid revealing the authors’ identities in the text. The submissions should pose at least one and up to three challenge questions in the area of “Human aspects of Smarthome Security and Privacy”. Submissions may be at most 3 pages excluding references and appendices. First, pre-proceedings, and final post-proceedings versions of the papers should be in two-column SOUPS format. Currently, the final (post-proceedings) versions of position papers are expected to be up to 5 pages.